A painfully protracted muddle of dull deals and somnambulent standoffs. 135 min. Universal Pictures. Director: Michael Mann. Cast: Colin Farrell, Jamie Foxx, Gong Li, Naomie Harris, Ciaran Hinds. An unfortunate folly, Michael Mann's Miami Vice was intended to be a modern take on the concept behind the hit '80s TV series. Instead it plays like a bad '80s movies, except shot in dingy post-milennial digital video instead of now-campy gloss. It's surprising to come to this conclusion, but moviegoers might be better off Netflixing Band of the Hand than sitting through the latest by accomplished writer-director Mann (Heat). In what could well be the weakest performance of his career, Colin Farrell plays James "Sonny" Crockett, opposite Jamie Foxx's Ricardo Tubbs. The Miami vice cops flub a stakeout then watch helplessly as a sweaty informant fails to outlive his usefulness. So far, so bearable, but once Crockett and Tubbs lobby to infiltrate and take down a network of arms and drugs traffickers, the story turns into a painfully protracted muddle of dull deals and somnambulent standoffs broken occasionally by sexual trysting between Foxx and Naomie Harris or Farrell and Gong Li. With a cast that seems uniformly bored and dialogue that's joylessly, unintentionally funny (Farrell: "I'm a fiend for mojitos." Li: "I know a place"), Miami Vice is a long 135-minute slog indeed. Mann chooses not to stoke interesting character drama and accidentally fails to engage us in the plot. As compensation for the prevalent stylistic dourness, Mann writes in every kind of photogenic "transpo" (as the cops call it): jets, helicopters, speedboats, and cars. If only Mann had thrown in a pogo-stick scene to break up the monotony, but alas, no. Mann has always had a feel for exploiting a setting; with Miami Vice spending much of its time in Haiti and Columbia before returning to Miami, Mann takes every opportunity to grab mood vistas of sky over water. The strange, surprising beauty of the HD photography is the film's one real saving grace. Tubbs knows of what he speaks when he points out, "There's undercover and there's 'Which way is up?'" Even with that kind of cliché to work with, Foxx gives a straight-ahead performance peppered with mumbly witticisms (I suppose anywhere is up from Stealth). Ferrell's stilted, seriously miscalculated turn betrays his physical and mental state at the time of production (rehab immediately followed); Mann tries and fails entirely to cut around Ferrell's sometime twitchiness. Li's simply in over her head, and even the supporting cast has been filled and directed with the deadest of deadpan in mind. With stars that can barely pose well, no improvement in substance, and no juicy entertainment value, what's the point of revisiting Miami Vice? Yes, it's a Michael Mann movie, but the Mannliness of Miami Vice is sadly old-hat: the slathering of pop, the ultraviolent deaths, and even the heavy artillery just remind us of how utterly Miami Vice fails to live up to Mann's urban-thriller forebears. "Sometimes," I jotted during the Miami Vice screening, "a film just doesn't come together," and the final commitment to deliver some action (accompanied by a cheap variation on "Do you feel lucky, punk?") is far too little far too late. One's subjective experience of the Miami Vice high-def Blu-Ray transfer might be that it is often grainy and sometimes unfocused. But having seen the film in theatres, I can tell you that this disc looks at least as good as (if not better than) any theatrical print. It's a wholly accurate rendering of the director's vision, and I was surprised to find no evident digital artifacts. The DTS-HD Lossless Master Audio track similarly replicates the theatrical experience, right down to the sometimes mumbly, "say again?" dialogue. Michael Mann contributes a screen-specific Feature Commentary that demonstrates his depth of knowledge in the workings of the DEA, the various problems that plagued production (including Gong Li's limited English), and how this Director's Cut featuring approximately twenty new minutes consitutes a Director's Expanded Version more so than a Director's Cut (which would imply the theatrical version wasn't). "Miami Vice Undercover" (13:03) focuses on the undercover work done by the DEA, and what the actors learned from them. Participants include Mann, Jamie Foxx, John Ortiz, former undercover agents Lorenzo Toledo & Alex Alonso, Roy Rutland of the Miami-Dade Police Department, Naomie Harris, DEA undercover agent Towanda, Elizabeth Rodriguez, and former federal undercover agent Robert Mazur. Most amazing: footage of Farrell being "punk'd" by DEA agents; the star thinks he's in a real undercover op gone wrong. "Miami and Beyond: Shooting on Location" (10:01) gets into making-of territory, with Mann, DP Dion Beebe, Foxx, Farrell, security advisor Jim Milford, set decorator Jim Erickson, transportation captain Howard Bachrach, Justin Theroux, and Barry Shabaka Henley discussing the location shoots in Miami, the Dominican Republic, and Uruguay. We get to see location scouting and camera tests, as well as behind-the-scenes footage from the film's shoot. 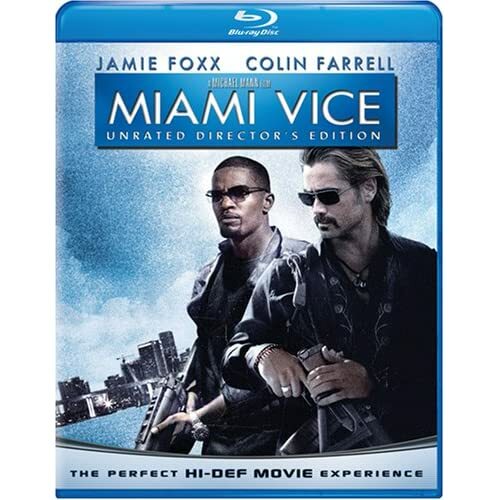 "Visualizing Miami Vice" (12:42) shows Mann at work, as well as interview clips in which Farrell, Theroux, stunt coordinator Artie Malesci, Bachrach, Erickson, Beebe, aerial coordinator Craig Hosking, aerial photographer Hans Bjemo, special effects coordinator Bruce Steinheimer and Mann himself explain the director's visual genius and the particulars of the HD photography. The disc includes three quite interesting Behind-the Scenes Featurettes (10:14 with "Play All" option) on "Gun Training" (2:43), "Haitian Hotel Camera Blocking" (2:54), and "Mojo Race" (4:25). Each offers raw footage of an aspect of pre-production or production. All are worth watching, but the second was most interesting to me, as we get to watch Mann and the actors work out the actors' positions and movements relative to the camera. Universal also offers its branded U-Control experience, most (not all) of the video-based extras from the previous DVD have been repurposed as part of a Picture-in-Picture feature. With U-Control enabled during feature playback, an icon prompts the viewer to bring up behind-the-scenes footage, "tech specs" video, GPS mapping, cast bios (pop-up text), and production photographs when available (some U-Control features cannot be displayed at the same time). The U-Control menu also allows on to see at a glance and select on the fly any one of these features. 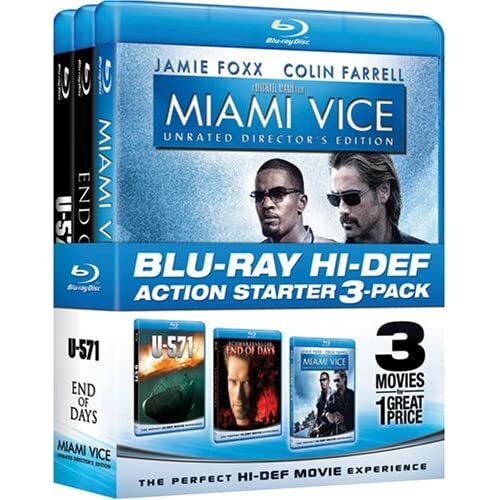 It all adds up to a very impressive special edition for Miami Vice fans. All site content © 2000-2019 Peter Canavese. Page generated at 04/25/2019 08:52:26PM.